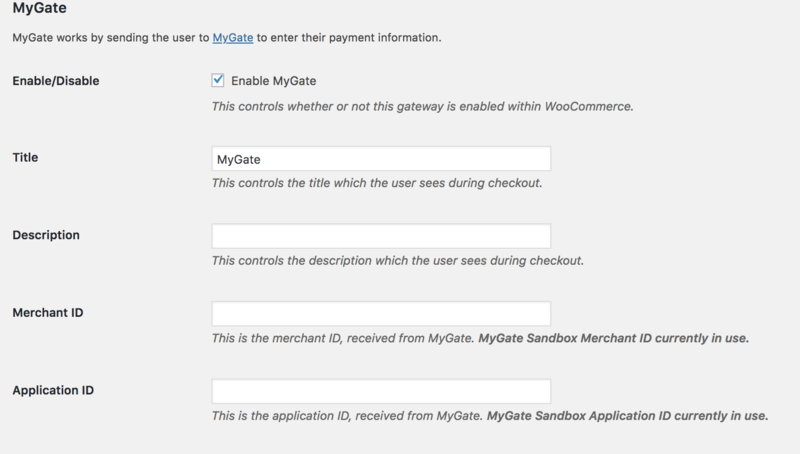 The WooCommerce MyGate extension is a direct payment gateway that enables store owners to accept online credit card payments and other payment options (e.g., check payments card) using My Virtual. Merchants can view and manage online credit card processing and other transactions through MyGate’s Web Console, which is used to manage all transactions. MyGate accepts VISA, MasterCard, Diners Club and American Express credit card payments. Select Payment Gateway to accept credit and debit cards. Complete the editable PDF form and agree to Terms of Service. Download the form and attach to an email, and send to sales@mygateglobal.com. Or print and fax to the number at the top of the form. MyGate will contact you with an answer and login details, after which you are issued a Merchant ID and Application ID for use on your live site setup. Select MyGate. You are taken to the Settings screen. Enable MyGate – Tick the checkbox, if ready to go live. Leave unticked if you wish to use Test- Sandbox mode (see next section). Enter a Title and Description shown to customers in checkout. Enter the Merchant ID and Application ID from MyGate account. Leave Enable MyGate Sandbox checkbox is unticked. Sandbox Merchant ID and Application ID should be blank. Untick Send Debug Emails checkbox. Enable only when troubleshooting is needed. Enter an email address for Debug logs. Tick the Enable MyGate Sandbox checkbox. 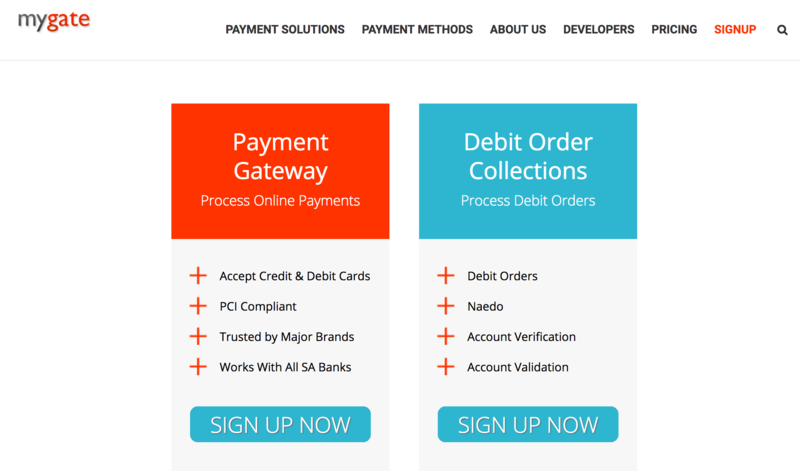 This puts the payment gateway in development mode. Enter the Sandbox Merchant ID (Testing purposes only). Enter the Sandbox Application ID (Testing purposes only). Verify that the Enable MyGate checkbox at the top unticked. 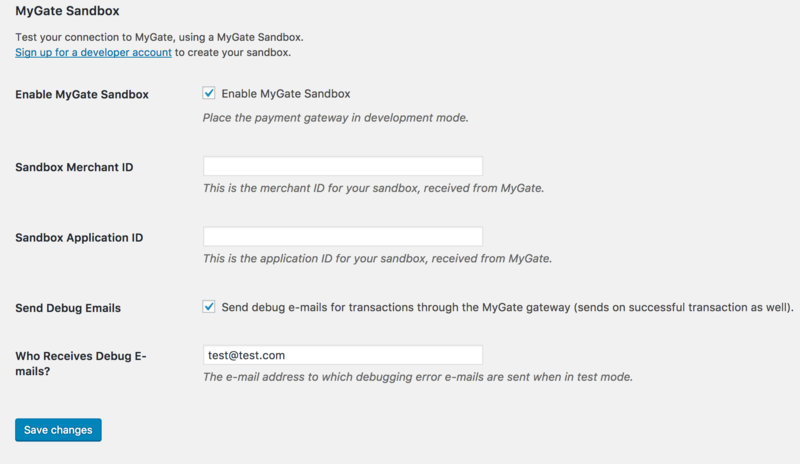 Remember to disable Sandbox when development and testing are done, and you’re ready to go live and take payments.